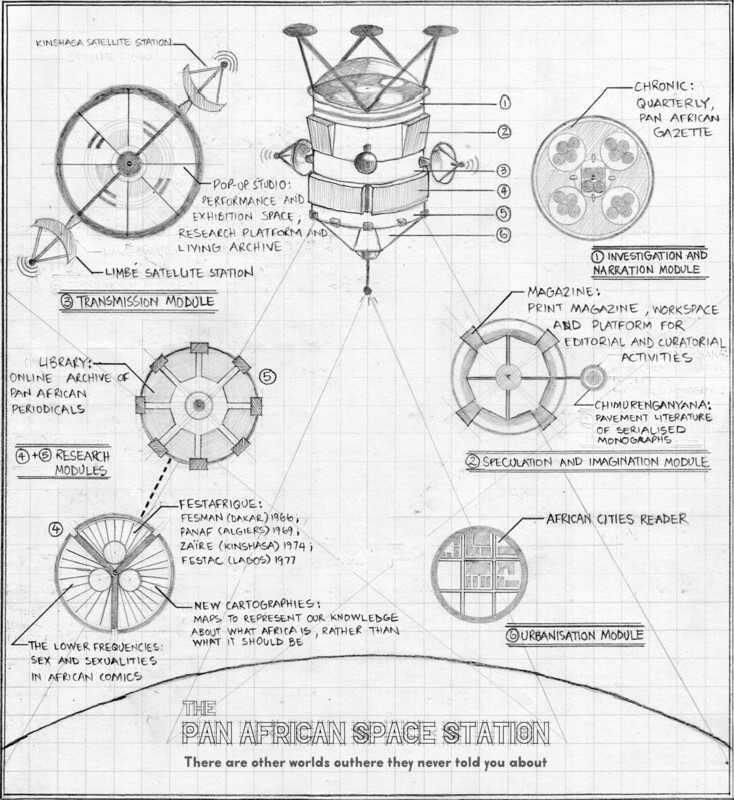 Founded by Chimurenga in collaboration with musician and composer Neo Muyanga in 2008, the Pan African Space Station (PASS) is a periodic, pop-up live radio studio; a performance and exhibition space; a research platform and living archive, as well as an ongoing, internet based radio station. Working in transitory spaces and at the intersections between different fields, organising sound, music and words into new forms of knowledge, PASS is a machine for travelling at the speed of thought – it borrows its slogan “There are other worlds out there they never told you about” from the philosopher, composer and bandleader Sun Ra. PASS seeks to challenge the concepts this present has of Africa and to excite new transitory and transient communities with each journey, bringing focus to collective experience and targeting an investigation into how we locate ourselves and how we mediate our human and historic commonality. Taking advantage of both the intimacy and unpredictability of the live studio and the reach and scope of the internet, PASS seeks to forge new collaborations across time and space. The live studio becomes one for entangling different realities and experiences – with participants and listeners prompted by ideas of utopia and oppression, history and the future, borders, time, art and technology, and, more importantly, community. A combination of live conversations, travelogues, discussion sessions and performances, together with exhibitions of new and archival material interrogate our shared histories. PASS landings may be connected to larger events – festivals, conferences, exhibitions – or as independent interventions. The programming of each pop-up studio is curated by Chimurenga in collaboration with local cultural producers and thinkers. PASS has landed in and transmitted from Johannesburg, Paris, London, New York, Lagos, Amsterdam, Helsinki, Cairo, Dakar, Mexico City and Harare featuring over 150 artists, musicians, writers, activists and more. At the end of each live event, recordings are recirculated via the livestream, and uploaded as podcasts to Chimurenga’s Mixcloud page, culminating in an ongoing archive of conversations and experiences. Thus, through a single event, the PASS pop-up studio aims to bring together the processes of creation and production; documentation and archiving, and, finally, dissemination and broadcasting. Other PASS projects include a series of intimate performance-lectures titled “Stories About Music in Africa”, and stand-alone live events featuring the likes of Floating Points, Ayetoro, Studio Kabako, Cindy Blackman, Anthony Joseph, Philip Tabane, Georgia Anne Muldrow, Toumani Diabate, Netsayi and many, many more.